If you suffer from flat feet, you've found a friend in these ultra-supportive foot supports. 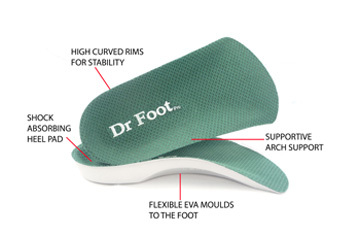 The soft cover and the flexible EVA base material create an excellent arch support which immediately treats the cause of the flat feet. Dr Foot Pro 3/4 length insoles provide the support you need to insure immediate relief from flat feet.